For most collectors, 2015 Topps Chrome Football is about its cornerstone Refractors and the promise of one Rookie Autograph per hobby box. That doesn't change, but there's a decent amount of content surrounding it as well. The 2015 Topps Chrome Football base set has 200 cards. It's split evenly between rookies and veterans. All have more than a dozen Refractor parallels plus four different one-of-one Printing Plates. Basic Refractors are inserted 1:3 hobby packs. Hobby boxes also come with one two Green, one Pulsar and one Blue Wave Refractor. Numbered Refractors include STS Camo, BCA Pink, Black, Blue, Gold, Sepia, Red and Superfractor (1/1). New Diamond Refractors are only available in hot boxes where they're inserted one per pack. Variations return for both rookies and veterans using different photos. 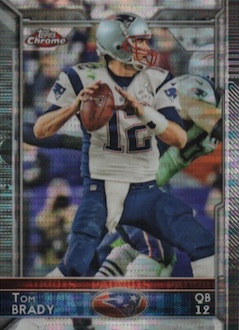 Variation Superfractors (1/1) make their debut in 2015 Topps Chrome Football. 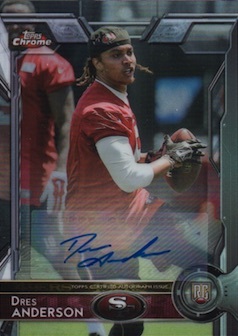 Rookie Autographs focus on on-card signatures. Like base cards, they have lots of Refractor parallels, all of which are serial numbered. The rookie signature theme continues in the numbered Dual and Triple Rookie Autograph inserts. There are also Rookie Autograph Patches that come hard-signed and with a multi-colored swatch. Only players from the Rookie Premiere have autographed patch cards here. Like previous years, select rookie and veteran variations have signed versions as well. On the basic insert front, Topps 60th Anniversary draw from six decades worth of designs to create new cards of veteran and rookie players. These have numbered Refractor, Pulsar Refractor and Superfractor (1/1) parallels. Select players also have autographed versions. 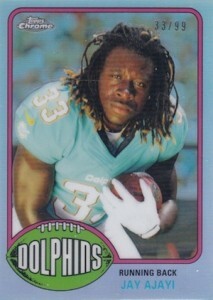 1989 Topps Football spotlights first-year players with the 1989 Topps Super Rookie design. 1976 Topps Football does the same with the mid-70s look. Both have Pulsar Refractors (#/50) and Superfractors (1/1). 1989 cards also have Gold Refractors (#/75). Some players in both sets also have autographed versions that have on-card signatures. Taking a best-of approach are All-Time 1,000-Yard Club, focusing on receivers and running backs, and All-Time 4,000-Yard Club cards for quarterbacks. Autographs are also available for both insert sets. 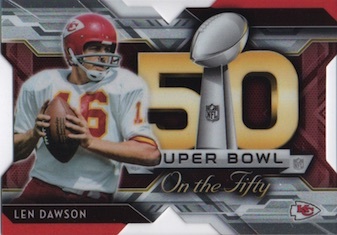 Super Bowl 50 Die-Cut limits its checklist to greats who have won football's biggest trophy. Parallels include Refractors (#/99), Pulsar Refractors (#/50) and Superfractors (1/1). 60 cards. View a detailed guide and gallery. 13 cards. Serial numbered #/75. 30 cards. Serial numbered #/10. Good: Good mix of Refractors, on-card autographs, moderate price tag. Bad: Some sticker autographs, weaker autograph checklist, key rookie autographs appear to be short prints. The Bottom Line: Chrome has become a collecting institution and is still one of the biggest releases of the year. Having said that, many collectors were burned in 2014 and the 2015 maintains largely the same format. As goes the flagship design, so goes Chrome. Given the rather large design change, 2015 Chrome does stand out. I will say that it doesn’t feel quite like Chrome football without the standard silver border and the design is perhaps a bit too busy for Chrome. However, that really falls more on the main set and not Chrome. Like any Chrome set, Refractors are plentiful and my box yielded a fair amount of color with five different parallel tiers. To me, that is a great amount that is neither too much nor too little. Most of them were not numbered, perhaps speaking to the overall production, but the consistent splash of color is nice. Inserts are mainly just Chrome versions of the retro cards from the flagship set, but the end result is solid. It also gave me the standard Chrome design that I was missing. I particularly like the 1989 Super Rookies. 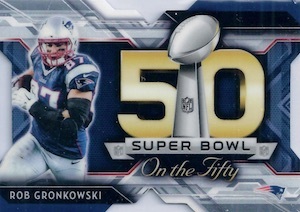 The only really new thing is the Super Bowl 50 On the Fifty die-cut cards. While die-cuts have been done ad nauseum, I will admit that the design has a certain regal quality, and, while the actual die-cut design is unnecessary, it does make the cards stand out. One thing I did not come across is the base short print variations. I appreciate that Chrome makes them much tougher to pull but I still feel like things have gone too far with variations and no more than twenty is needed in any one set. The real appeal of Chrome has been the on-card autographs for top rookies and that continues to be the focus. However, it is a bummer that stickers continue to infiltrate the product. While all the big names are found in the autograph checklist, including limited autographs for all-time greats, the rookie checklist is filled with a lot of weak subjects. When combined with the fact that most of the best rookies appear to be short-printed, the chips are stacked against collectors, especially those that bust by the box. 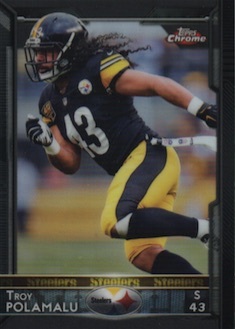 Above everything else, few football products at any price can match the potential value in Topps Chrome. Some of the biggest pulls each year come from these boxes and that cannot be overlooked. Having said that, with only one autograph per box and a checklist that does not scream value, it is a tough proposition to get your money’s worth even at $60-70 per box. Helping value, low-numbered Refractors for the right player can also save a box. I am a fan of Chrome Football and I am disappointed this is likely the last release for a while. I liked the selection of Refractors I pulled in 2015 Chrome and I also enjoyed the inserts. While pulling a no-name autograph does not ruin the fun, and I generally have realistic expectations, it was a downer to pull a sticker autograph. It does, unfortunately, seem to continue a trend from Topps in many 2015 releases. 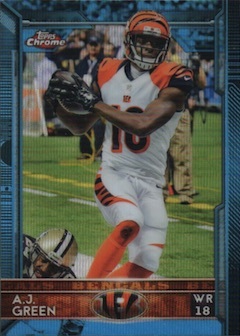 Hope Topps learned something from this year’s, but from reading so far it doesn’t look like it. Seems to be a carbon copy of last years success at ripping collectors off. All I know is I’m not preordering again after getting burned. I’ll let everyone else buy cases and wait till they’re $400 and then buy. Again 2013 was so much fun with 6 of the 8 refractors being numbered instead of just 2 and every auto was serial less than 600 which was huge success and value for collectors. For a product with just one auto is it really that hard to number the autos. Every other product has 3-6 autos for the same price with more numbered cards for the same price, but Topps just needs to squeeze more money out of Chrome fans till there are none. You got an auto numbered to 600 or less which meant you had as good as chance of hitting a Le’Veon Bell as hitting a Dion Sims and you got at least 4 numbered cards. So you be the judge is Topps ripping collectors off. Because it seems the Topps business trend being adding more unwanted rookies to the checklist, limiting star players, decreasing numbered cards, and hiding the print runs of autos so people don’t know that Mike Davis has five thousand autos in just one product. Nice design, premium rookie auto, and good for set completion. Good rookies sets of parallel or refractors! Any news on the autos /100? They look like they’re Yellow, but similar to the Sepias where the entire card is yellow, not just the border. They seem to be bonus autos (2 autos in boxes that have them). 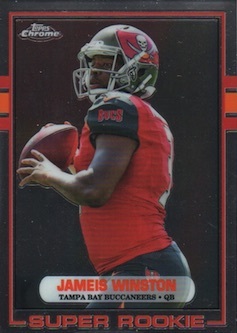 Bad Bad idea, no QB can carry the class, and I don’t foresee anyone making any money on this product, other then the local card shop selling them for 15-20 above cost. This product at anything over 600 dlvd a case is a disaster. Good rookie refractors pulled mariota pulsar and Peyton Manning 60th anniversary auto #7/10!! And pulled a Gurley base refractor and the Brett Favre SP!! Just wish they would add a second hit even if it was just a relic! My case was a total disaster. Case hit was a Cameron Artis Payne pulsar autograph numbered to 15. Received zero autographs or refractors of Winston, Mariota, Langford and Cooper and only one unnumbered green refractor of Gurley. Also had such unnumbered autograph “hits” like Austin Hill, Josh Harper, Mike Davis, Justin Hardy, Tre Mcbride and Vince Mayle. I may have gotten $200 worth of cards. Opened two boxes, one of which was a Blue Refractor Hot Box, and did not get even half the base set. One of the autographs was a nobody; the other was at least salable. The inserts, though, are complete junk. One of them was a case hit Steve Young card that I cannot sell for five bucks, and the Blue Refractors, rare though they might be, are not numbered, and I cannot sell the lot of them either. Stay away! Busted one box and did not get anything of value. No good rookies and a Levi Norwood rookie auto. Guy is not even in the NFL. I might buy some more boxes if the price comes down considerably. 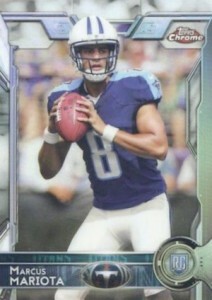 Another disappointing year out of Topps Chrome. Guess when you start with the same setup as last years steam pile. All you are going to get are more steam piles. I’ll build the set when the price drops to $30. No rookies seem to jump out at me to be superstars so the price should drop pretty fast as collectors get hosed by Topps again and their memory of last year’s debacle emerges. When case hits are not really case hits if you can easily find them in retail and you have unnumbered parallels that do nothing. What do you expect to happen. Card #68, Bobby Wagner, is actually Bruce Irvin. And its obvious. Topps too busy worrying about dollar bills than what they are releasing. First of all the low ratings are based on your box busting experiences? Seriously? If you watch all cases that are being busted, the product is much better than last year. In addition, the value of a box is not just the autograph. I think the box prices will stay relatively the same or go higher at least until the season is over. The rarity of the Mariota/Gurley/Cooper/Winston Base RC Autos make them extremely valuable if hit. 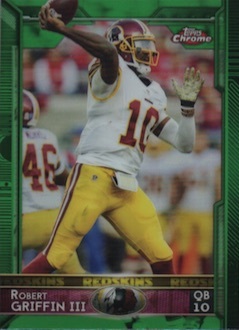 This is the same as 2012 Topps Chrome with Luck/RG3/Trich. 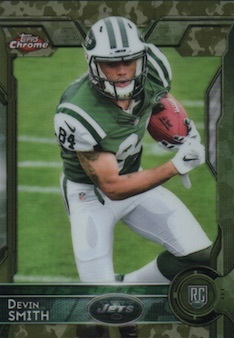 2013 Topps Chrome had a weak draft class going in and Topps adjusted. Topps doesn’t do Case Hits! Some cases will have 2 Winstons and 2 Mariotas and 1 Cooper..others will have none. The randomness, such as with Bowman/Chrome/Draft Products in Baseball, is what drives people to the product. I received my two Hobby boxes of this set and not overly impressed with it. Good card quality, some of the pictures are a bit blurred though. Not overly impressed by the 2 autographed cards, I’ll just have to wait them out to see what they do later down the road. Not one regular rookie card of Mariotta or Winston between the two boxes and I got my fair share of duplicates. I expected more out of a set that comes out this late in the season. 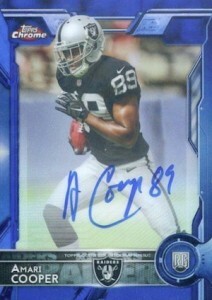 A nice box I bought… I got a 1976 Topps refractor autograph Amari Cooper 01/25. Also, 1/1 on Dres Anderson. 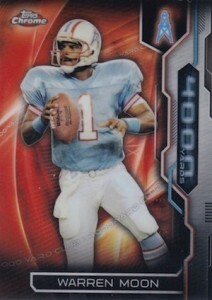 Very difficult to see the card as superfractor, just noticed the 1/1 on it then had to analyze then noticed it barely. Bad design. But I aint complaining about Amari Cooper autograph. Any product you can buy at Walmart just needs to bleed to death already and leave the hobby. TOO MANY UNDRAFTED/IRRELEVANT ROOKIES MAKE UP THE CHECKLIST. can someone explain to me how David Johnson and others have a variation autograph but don’t show up on this checklist? Phx � This was the checklist provided by Topps. David Johnson is not among the variations for Topps Chrome and he does not have a variation autograph. He only has a base rookie autograph and corresponding parallels and is listed in that portion of the checklist. 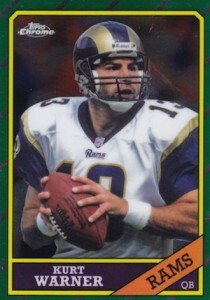 He does have a variation card in regular Topps Football. I am a recovering cardaholic, having fallen deep into the hobby addiction last year chasing some nonsense pipe-dream of card glory. I am ashamed of how much I wasted on this product last year…. and after some deep self-reflection, stepped away from cards. Today, I relapsed. I spent $70 on a hobby box of this steam-pile garbage and knew it was a mistake as soon as they bagged it. NO Gurley, Mariota, Winston, Cooper, Diggs base cards pulled… let alone a base refractor. Maybe this is a blessing in disguise, as I realize I would have to diagnose myself with severe retardation to dwindle further into this bullsh*t product. Correct me if im wrong but I believe this is the last year Topps is doing Football.Thats what I heard last year,that PANINI is getting there rights in 2016 like they did Basketball.I need to research though.If thats true we are really doomed.If you have heard the same or know otherwise let me know. John � You are correct. Panini takes control of the full NFL/NFLPA license in 2016. I have good news and I have bad news! But, the good news far outweighs the bad! 1) I have always been a big fan of Topps Chrome Football but never had any luck busting wax until last year. I bought one hobby box and pulled a Drew Brees auto 1/10! 2) I have always been a big Georgia Bulldog fan so you know what I wanted for Christmas? Yes, I bought two 2015 hobby boxes for $70 each and the second box was a Todd Gurley auto refractor /150. Yee Haw! 3) Two Amari Cooper base rookies, and four numbered refractors, 1 /99, 1 /199(Matt Stafford), 1 /299, 1-/499. I’ve been picking up a lot of rack packs at target for 9.99 and it’s been ok. Not any autos though and only a few numbered refractors that weren’t any good and I’ve purchased 7 rack packs or so. I also bought the retail box from Walmart that’s 34.99 and that was a huge disappointment because those packs are different as they do not have nearly the same odds for refractors. I know retail is not the best way to go but it’s definitely something topps can improve on for chrome especially considering you only get like 15 cards total for 10 bucks. That’s almost 70 cents a card. Maybe they could match what they did with topps update and have exclusive serial numbered cards for retail. Maybe someone here can help me with this… Opened a hobby box pulled a Nelson Agholor auto 8/50 Randy Gregory base /99 Jordan Matthews base /399 super rookie Winston 2/99 and last pack had Jesse James rookie auto BCA pink /75 ? I’ve checked its not a var. Rookie auto error? Any help is appreciated. Purchased 2 blaster boxes and got an auto in each one. 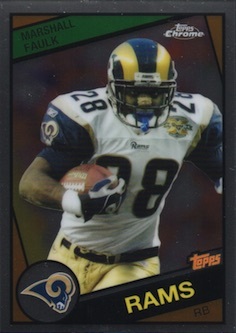 Tre McBride /75 – nothing huge but for a blaster I’ll take it. Plus a couple other nice retro style inserts. Better than most blasters. I have purchased over 10 cases and pulled one TJ Yeldon patch auto /75 a few good autos including pink gurley, 4- numbered out of 5, jamieson SP auto, and some golds, camos, etc…and the last box i pulled a eli manning 1/1 superfractor 60th ann. auto. this is the last year so and i have loved the technology of chrome so needless to say i have had my fix. im confused, can we not rely on these checklists? there are several autos, like J.J. Nelson, Arik Armstead, etc.. that have autos but arent on here?? Scott: Updates to checklists are not uncommon and we do out best to add missing elements as soon as we are aware of them. Even though there is an abundance of stars and rookies in this set, there is just too much going on as far as variations. Not good.